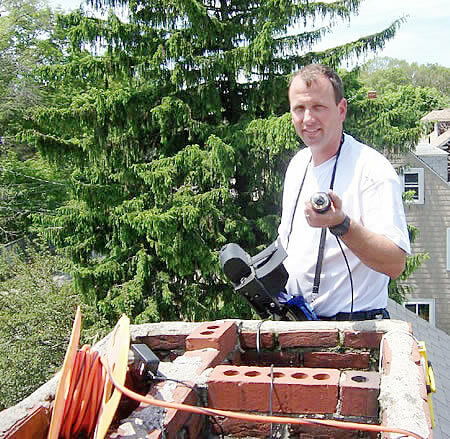 Four Seasons Chimney Service, Inc. is a FULL SERVICE chimney company. Not only do we offer chimney sweeping, but we are proud to be able to offer our expertise with a host of chimney and venting issues. For more information, visit our Chimney Inspection page. For more information, visit our Chimney Liners page. For more information, visit our Chimney Restoration page. There are several styles of damper that sit just above the fire-area and we can help you repair them when broken. Or, when they can’t be fixed, we can install a new one for you. For more information, visit our Damper Repair page. If your stove or fireplace smokes or doesn’t run properly, don’t lose hope of having a hassle-free experience. We can help! Over the years, we have seen all kinds of smoking problems: Some appliances smoke when the weather is wet, some smoke when it’s especially windy outdoors, some smoke enters the home in some other part of the house – and in some cases, it just seems impossible ever to have a cozy fire without smoking up the house. The good news is that many smoking problems can be solved. The trick is to understand not only the fireplace or stove, but to understand the whole picture: the appliance, the chimney, the house, and the surroundings. We will evaluate the entire system, and advise you on what’s wrong, and how it can be fixed. It may be that all you need is a good chimney cleaning. But if another remedy is needed, we will explain what’s happening, and provide you with a quote. We offer a full range of repair services for smoking problems. So don’t give up on the idea of having a cozy fire during the holidays! Call us for an appointment to come and evaluate your chimney system. For more information, visit our Masonry Repair page. Are you ready to try to lower your heating costs? Many New England families have already installed a wood or coal stove, or perhaps a pellet stove, in an attempt to beat our northeast heating bills. Four Seasons Chimney Service has valuable experience with stove installation in a variety of configurations. This experience will benefit you as a homeowner considering the purchase of a stove. This is what most people think of when they think of a chimney sweep. Although the chimney sweep no longer arrives at your home with a top hat and tails, we understand that shaking hands with a chimney sweep is still good luck! For more information, visit our Video Inspection page. Wood Stove Insert: The picture below shows a wood stove sitting in (or in front of) a fireplace. Note the pipe coming out of the back of the wood stove and going up the chimney. To clean such an installation requires more time than to clean a wood stove that is not connected to a fireplace. Although there may be various names for the setup pictured, it is important to note that the distinguishing factor is the involvement of the fireplace. For more information, visit our Waterproofing page.